I am a huge Sons of Anarchy fan. I found the series late – only last year – but I devoured the 6 seasons that existed in a very short space of time, and have been eagerly awaiting season seven which started in September. 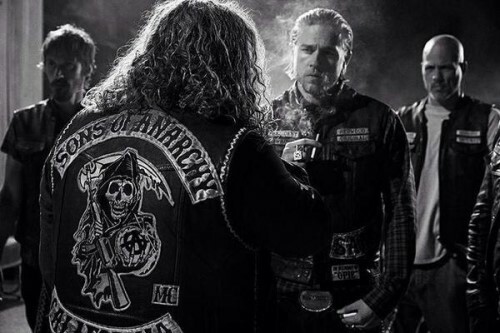 The show is dark, which you would probably expect, being about a motorcycle club. But it is also, in its purest form, a soap opera about a motorcycle club. Some of the storylines are so soapy, they would not look out of place on The Bold and The Beautiful. But that is part of what makes the show so brilliant. 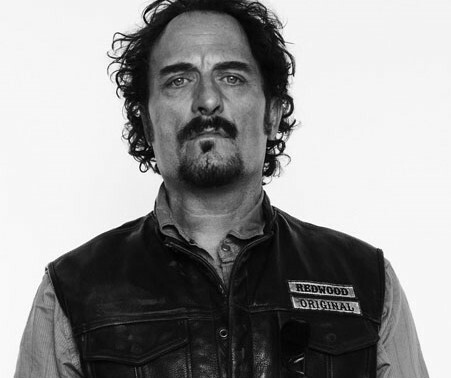 My favourite character is Tig, played by Kim Coates. 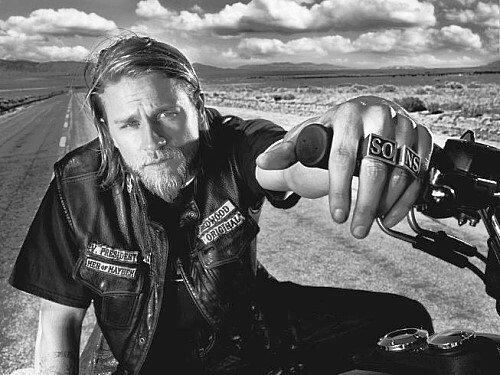 Though of course Jax, played by Charlie Hunnam, is fascinating eye candy to watch. Do you have a secret to share? Do you love a TV show that I should add to my must watch list, or do you have a secret to share? Let me know in the comments! Hey Snoskred, Thanks for visiting my blog. I’ve added my link to your list and hope to find a few minutes to explore that list. My secret delight on the screen is Game of Thrones which is not my usual more cultured fare. A young friend urged me to watch and I found it hard to get into the first episode and then devoured everything that I could find in record time. I usually rage against gratuitous violence but a bit of hacking of arms, legs and heads was a joy. There is an issue with killing off any character who gathers a modicum all sympathy, but who needs sympathetic characters. I remember Hunnam when he he was much younger and he was in Queer as Folk. Agents of Shield is really catching my attention this season. That is all. OMG I LOVE THIS SHOW!!!!! I am so sad it is in the final season. I had dated a 1%er once and road with him as his old lady with his MC until I realized I was flirting with disaster. Guess that is why I love the show so much? I do have fond memories though rather happy to have left it behind. I love SOA and have been from the first series. I’m sad it’s coming to an end, but all good things must end. Better to go out on a high. Hi! Thanks so much for visiting my blog and sharing your admiration of British tv shows. You live in South Wales? Isn’t your country where the show Hinterland is filmed? I found the first season of Hinterland on Netflix and just love it – for the stories, acting and also for the gorgeous cinematography. Sons of Anarchy actually films some its action around a part of California I’ve lived…Lodi. SofA is one of my younger daughter’s fav shows. Oh Boy do I love this show, and I’m such a stalker I follow Kurt Sutter on Facebook and instagram..lol. I’ve been in the from the beginning and can’t believe it’s going to end in just 4 more episodes. I’ve been sucked in and then when it’s over what in the world am I going to do? I also LOVE Justified which also has one season left. If you haven’t seen it, you should check it out. Walter Goggins who plays Venus Van Dam in Sons is such a redneck bad guy in Justified, you can’t help but love him.. Thanks for finding me and It’s awesome to know there are people out that I have so much in common with. You’ll be seeing more of me! Justified is already sitting on my network share waiting for me. :) It was next on my list to watch but then all the shows started coming back. :) I’m rewatching The Fall in preparation for season 2 hitting this week right now. I love Venus, so am excited to know about the redneck bad guy!